Making Tax Digital is rapidly approaching. We talk to Alistair Hayward-Wright, Director of chartered accountancy firm, Hayward Wright, on 5 steps to get your clients ready for the new legislation. Yet, the work continues as the firm adds new clients. “When we get new clients through the door, they want to know more about Making Tax Digital and how they can get compliant. I believe this will go on for at least another twelve months,” says Alistair. To scale communications, Alistair recommends creating standardised email templates. You can then drag and drop in your client logos to keep your messaging personal. “We’re getting clients set up in a matter of hours now,” says Alistair. When messaging, it is key to set a tone of urgency to encourage action. Plus, if you have a team, divide clients between client managers and offer them support and guidance. If you are just starting out or have welcomed a new set of clients, Alistair advises to focus on the segmentation, skip the seminars and dive straight into one-to-one sessions. In these sessions, show your clients how to use technology like cloud-based accounting software and Receipt Bank. “We didn’t really talk about MTD. It was the catalyst for talking to our clients,” says Alistair. Ultimately, you can use this as an opportunity to move your clients into a more efficient way of working - to make your life, as well as theirs, easier and more productive. With the introduction of MTD, you will need to create quarterly VAT returns. To avoid stretching the workload of your end-of-year accounts four times a year, you must digitise processes to save time and money. “Before Receipt Bank, we spent 1½ - 2 days per quarter on creating VAT return for one of our clients. Now, that’s down to 4 hours,” says Alistair. No matter where you are on the journey towards compliance, time-saving technology is available to support you through the move. The key? Scalability, and positivity. Approach the legislation as an opportunity to build closer relationships with your clients, and introduce technology that adds even more value to your client experience. 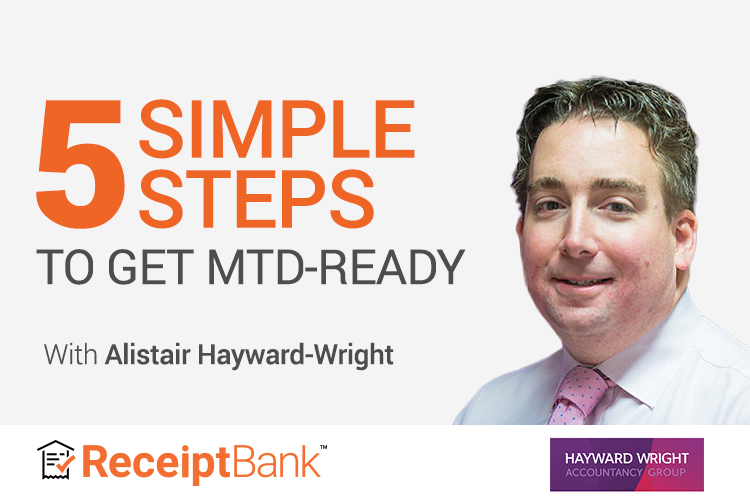 Hear Alistair explore five simple steps to get MTD-ready in his upcoming webinar .